2011 BIG Holiday Promotion Gift! Wow! What an incredible holiday season this has already been at Passanante’s Home Food Service! We want to thank all of you so very much for helping us make our 2011 BIG Holiday Promotion such an incredible success! We delivered dozens and dozens of samples to eagerly awaiting families and are so happy you all took the time to send us such wonderful referrals. 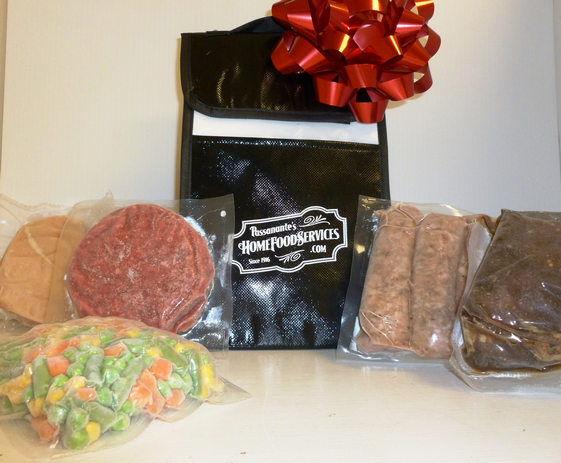 In case you were wondering, the holiday package your friends and family members received included a boneless chicken breast, 3 handmade italian sausage links, an 8 oz. marinated flatiron steak, a jumbo steak burger, and a package of organic mixed vegetables. – No wonder they were all so excited, right?! We are having so much fun getting to know our new and existing customers as we continue to grow Passanante’s. As you know, our goal is to always provide you with delicious, healthy, and organic foods that you feel good about serving to your family. We are always available to answer any questions you may have about organic foods or hormone-free meats. Check our blog each week for useful information from what cut of meat comes from where, to delectable recipes, photos and more! Thanks again to all of our loyal customers as well as the willing referrals we have been able to get to know over the last few weeks. We genuinely appreciate all of you!! This entry was posted in Passanante's and tagged 2011 BIG Holiday Promotion, flatiron steak, Free, Home Food Delivery Service, italian sausage, jumbo steak burger, Organic Vegetables, Passanante's Home Food Service by Passanante's Home Food Service. Bookmark the permalink.